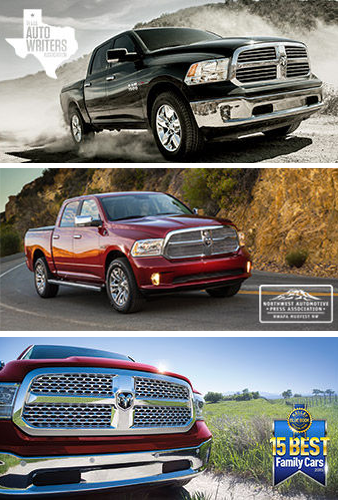 The 2016 Ram 1500s are here and once again this workhorse full sized pickup is stacked with awards but don’t let that make you think it doesn’t have room for more. The standard Ram 1500 Tradesman Trim has a max towing of 10,650lbs for a grandiose payload of 1,880lbs. That means that regardless of your desire to explore the many trim options of the Ram 1500, you’ll know why your Ram 1500 takes home the Extreme Capability Pickup of the Year Award at the Northwest Automotive Press Association (NWAPA) “Mudfest”. The power and durability, eco-abilities, on and off road handling, and value associated with Ram full sized trucks makes this awarded pickup a great option for our Tomball Area drivers. Whether you need a new truck for blazing the wilderness or your own property, the new Ram 1500 covers you and your family for whatever work or adventure presents itself. The 1500 was rated one of the best family cars and “…may be the most civilized truck on the market today” says Kelley Blue Book. Our Texas drivers will be happy to know that once again the 2016 Ram 1500 was named the Full-Size Pickup Truck of Texas by the Texas Auto Writers Association (TAWA) for the second year in a row. The 1500s will be equipped with a Torqueflite Eight-Speed Transmission and 3.6L PENTASTAR® V6 engine. If your workload requires a bit more power, consider the5.7L Hemi V8 Engine standard on the Express, Outdoorsman, Rebel, Sport, Laramie, and Limited Trims. Also standard on the 2016 1500 will be the Class IV Receiver Hitch making your Ram pickup the connector of work and power by giving it the efficiency and value that makes it known as the Best Full Size Pickup for the Money by US News. You may want to consider the highly rated Tradesman EcoDiesel HFE Trim. This workhorse delivers an astonishing 29 MPG for Highway and 21 MPG for city without sacrificing any substantial loss of power. The Ecodiesel 1500 has been awarded Rocky Mountain Truck of the Year by Rocky Mountain Automotive Press (RMAP) and Truck of Texas by the Texas Auto Writers Association. What makes this awarded pickup so useful could be the levels of customization that Ram offers. The 2016 Trims offer a wide variety of power and features designed to make your work feel like play and with the durability of Ram pickups, your play will stay fun. Ram drivers know that having the necessary tools allows them to be successful and the awarded 1500 proudly gives you all the tools you need so you know you’re always prepared.